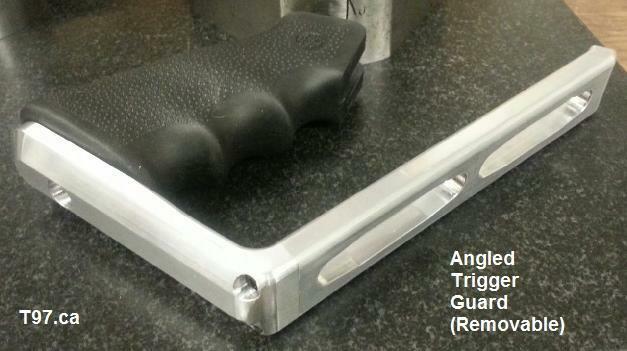 The T97.ca Lower Hand Guard (LHG) is a 6061-T6 aluminum component replacement for the T97NSR bullpup rifle's plastic lower. It was designed by the product developers at M14.ca, a retired Canadian Forces military officer, former gunsmith, and two expert CNC machinists. The LHG is a complex group of components designed to enhance the non-restricted T97NSR bullpup rifle and eliminate multiple shortcomings inherent to the original design. The LHG is CNC machined from a solid block of aluminum and it offers the end user a light weight, tight fitting lower housing with skeletonized fore end and improved trigger area contours for enhanced ergonomics. It features new trigger group components that deliver a 50% reduction in trigger travel and a pull weight of approx. 4lbs. for smooth, fast and more precise followup shots. It ships with a new aluminum "T-cut" lightened trigger and an ambidextrous trigger blocking device similar to the AR15 safety (marked accordingly and useable by the support hand thumb). It adds an interchangeable/removable "Standard Trigger Guard" or "STG" and AR15 pistol grip compatiblity (pistol grip not included). Finally, it ships with an improved magazine release button. Other features include attachment points for a QD sling at the front and 6 o'clock picatinny rail compatibility (for vertical or aftermarket angled foregrips) as well as a placement point for a T97.ca Gas/Brass Shroud for left handed shooters (earlier referred to as a brass deflector). The LHG also allows for the addition of bipods, AR15 finger stops etc.. As noted, the STG allows installation of a T97.ca-Forward Hand Grip. The STG is the only bullpup trigger guard that is removable and swappable for the LHG's Long Angled Trigger Guard (sold separately, coming 2016). Notably, the rifle field strip remains unchanged. The T97.ca LHG was in development for approximately 17 months (view, Official Thread of the T97NSR Lower Hand Guard (LHG) | PART II for more information on the developmental history of this part). 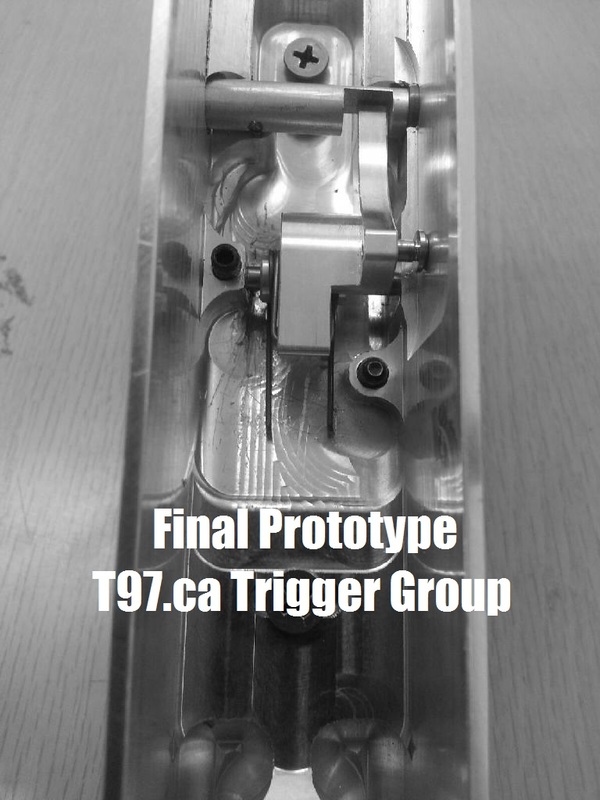 With 8 main housing prototypes, 6 iterations of our trigger group, 4 variations of our trigger, 16 range trials and multiple range reports online, as well as a program schedule affected by demand for the T97.ca FTU, the LHG is now in its final form and ready ordering. All parts ship with a Type II mil-spec. hard coat in black. Texture finish and color will match closely that of the T97.ca FTU. The T97.ca LHG is 100% compatible with the T97.ca FTU. Questions, comments or concerns can be directed to the owner and lead product developer at M14.ca/T97.ca via email or via text message (250) 888 9982 or by calling direct. "Fit and finish is superb and the install was simple. The improvement in function and feel of the new handguard and trigger is remarkable - I was surprised how big a difference the new magazine release button makes. I am very pleased with the design and quality of my purchases from T97.ca - your products have made me favor my T97 over my AR15!" "Had the gun out 5 times since getting the lower, probably 1000 rounds put through it. Zero issues, trigger still amazing." "Got my LHG. Very happy!! Big thumbs up Frank! Another fantastic product. Greatly improved the controls. Huge improvement on the trigger." Note: Unlike the T97.ca FTU (Flat Top Upper) no physical modification to the T97NSR rifle is required for fitment. Confirm T97NSR rifle is unloaded. Remove existing lower from T97NSR by removing take-down pin. Install T97.ca LHG onto T97NSR by first hooking front cross pin with LHG in near vertical orientation. Carefully rotate LHG about the front cross pin to fully seat the LHG onto T97NSR. Ensure trigger rod has seated on trigger bar capture pin (slight wiggling/actuation of the trigger necessary to locate placement). Install original rear push pin into LHG and T97. Ensure trigger is functioning by pointing the rifle in a safe direction and dry firing. The LHG can be unitized to the rifle using the set-screw from the underside (do not over tighten). An allen key will fit through the access hole for adjustment. The rear push pin should still be removable when the set-screw is in use. If it is difficult to remove, loosen set-screw. Once adjusted, apply blue threadlocker.